Silly hats make EVERYTHING 58% more funny. Fact. The last thing you want to see on your wedding day is a sea of bored and unhappy faces. It’s the happiest day of your life and, while you don’t have the same level of expectation for all of your guests, the last thing you want is for them to remember your wedding by using the words, “awful”, “boring” and “let’s block them!”. For you, the wedding is always going to be fun. If you want your guests’ faces to light up, you’re going to have to put your thinking caps on and get planning. Thankfully, the lovely people at Wedding Forward have put together an infographic which gives you plenty of ways to give your guests an amazing time on your wedding day. 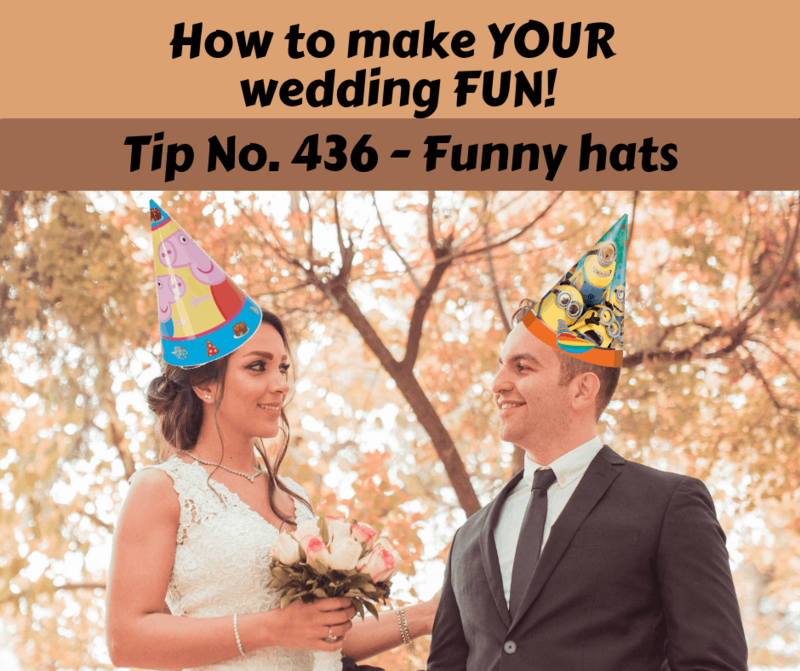 And, even though they have committed the cardinal sin of not using the words “wedding magic” or “wedding magician” anywhere in the graphic, it’s a great resource for you when planning ways to put the fun into your wedding day. Wedding food can be fun! A wedding breakfast doesn’t have to be a formal affair. There are lots of options you can incorporate into your wedding day to make it a bit more informal and fun. You could have a burger van, or fish and chip van (this blog post is doing nothing for my diet!). Moving away from food (thank you! ), you could have a coffee bar outside for your guests to order their frothy, extra tall, extra thin, extra skinny, mochachocacappalatte. (I’m pretty sure that I’ve just put a bunch of different coffee sounding words together there, so don’t order that!). Actually, ANYTHING can be fun! Whatever you do, the point is that you don’t have to create special pockets of fun throughout your day. Think about what normally happens during a wedding and then try to find ways to make that a bit more fun for your guests! A wedding is fun when guests feel relaxed enough to kick back and relax. No one wants to feel like they are on show, or that they need to act a certain way to impress anyone – that’s no fun. If all of your guests already know one another and are on good terms, this relaxed atmosphere could happen naturally. If not, maybe you need an ice breaker, so that they all don’t feel on edge – like they are meeting their partners’ parents for the first time? May I suggest an awesome wedding magician? No? OK, then. I won’t. Think about what you can do to help your guests relax on your wedding day and you’re well on your way to giving them a fun day. Would garden games help get them laughing? Maybe a caricaturist would help ease any wedding day tension? Would they appreciate your Aunt Carol getting drunk and singing “Itsy Bitsy Teeny Weeny Yellow Polka-Dot Bikini” – in Croatian? Here’s something that I shouldn’t be typing – you don’t need to spend hundreds of pounds on professional wedding entertainers to give your guests a fabulous time (of course, you CAN do this – and it would be money well spent, but you don’t have to). Just think about YOUR day, YOUR guests and what you think would help them relax and have fun, and go from there. And, if you do decide that a wedding magician would be perfect, you know where I am!